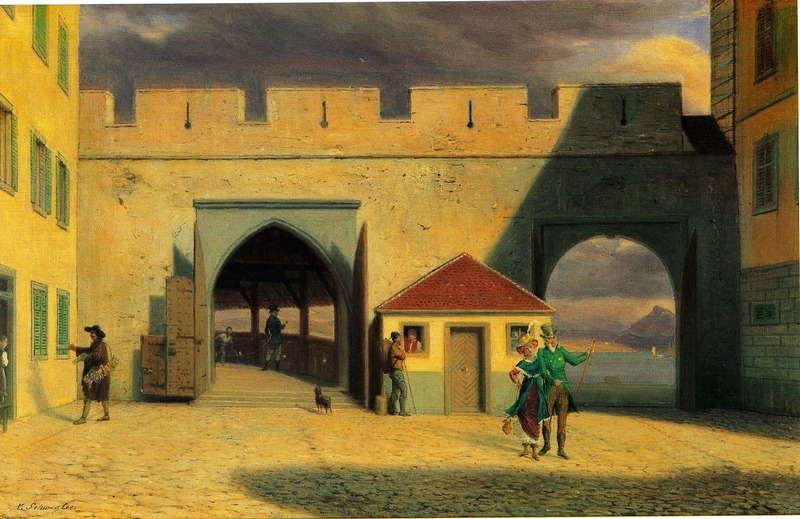 " The gates to the Hofbrücke and the Schiffslände " was painted by Xaver Schwegler (1832-1902) by order of the Korporation der Stadt Luzern. The painting shows the view from the Chapel square towards the lake as it looked shortly before 1835. That was the year when the wall and a part of the Hofbrücke were demolished. On the right side you see the zur Gilgen House, built in the beginning of the 16th Century. The house you see on the left hand side is replaced by a newer house on the same place. The right one with the rounded arch led to the landing stage. The left one with the pointed arch led to the Hof Bridge (Hofbrücke). In the foreground you see a Biedermeier Couple strolling into town. Behind them a farmer is chatting with the Bridge Guardian. The farmer's dog watches onto the Hof Bridge and lead's the observer's eye to a man with frak and a boy with a wheel. On the left you see a peddler presenting his ware to a maid.